I would like to share with you something that happened to my wife and I. Six years ago, when we bought our first home, we got all excited about it as many couples do, so we decided to do some upgrades on our new house like new appliances, new flooring, and obviously the paint. I brought our crew in, and we did all the upgrades in a short period of time, because we wanted to move in right away. When we were about to be done with all the renovations of the new house, my wife and my daughter came in to check it out. For my surprise, my daughter could not even stand up at the front door because the paint smell and fumes were so strong for her that her eyes got all watery, she could not breathe properly… it was bad! From that day on, I decided to learn more about low VOC, no VOC paints. Now, just for one moment, close your eyes and try to imagine that "new paint smell." That paint smell you imagine, the same paint smell that was so harmful to my daughter, is the VOC (Volatile Organic Compound). These compounds are traditionally added to the paint to enhance the color of it, as well as the spreadability, the adhesiveness, and the resistance to fungus and insects. Unfortunately, many of these compounds are released into the air at room temperature, polluting your indoor air and causing major problems for those, like my daughter, with chemical sensitivities, allergies, and respiratory illnesses. VOCs are necessary to make paint, but new technology had made them less and less essential. It is when the low VOC, no VOC paints came into play. Low VOC, No Voc paint contains zero or a minimum amount of compounds, which basically makes the paint almost unscented when wet, and no smell at all as soon as it is dried. Most manufacturers of low VOC paint strive to meet the Green Seal Standard, which guarantees them to have less than 50 grams of VOCs/liter. Two years later, after my daughter’s episode, we got an interior painting project in Leominster, MA. It was a condominium with 216 units, 16 hallways with 3 floors, common areas, community room, and offices. It was a big project, but the biggest challenge of it was that all the areas would still be occupied during the painting process; people would be living in their apartments during the renovation. The architects of this project have chosen a regular paint to be applied. I knew it was not a good choice because the regular paint would have a high release of VOCs, not to mention the number of complains we would have if anyone in the building were allergic to it like my daughter. After lots of planning and meetings with the architects, they finally agreed on switching the product for Low VOC paint, the product selected for this specific job was Sherwin Williams ProGreen Low VOC Paint. The job was done in almost six months, the crew worked every day 8:00am to 5:00pm in different areas of the condominium. During all the time that we were working on it, we did not have any complaints from the residents about the paint smell. That’s right! Not even one person made any bad comments about it. 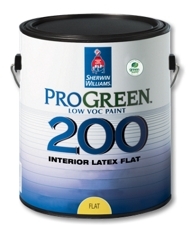 I was very impressed by the results even though I knew what the Sherwin Williams ProGreen product could do. If you want to get any paint project done, I highly recommend you to use Low/No VOC paint, it is a simple way to reduce the indoor pollution from your interior paint, get better indoor air quality for your home and also help protect the environment.